A letter from A. W. Macfarlane to Henry Shelton Sanford dated October 3, 1884. Macfarlane was the secretary for the Florida Land and Colonization Company (FLCC) from 1884 until its dissolution in 1892. Presumably, he worked in the company's main office, located at 13 Austin Friars in the business district of London, United Kingdom. In this letter, Macfarlane discussed the minutes from the previous meeting of the board of directors. Sanford, staying in Belgium at the time, was unable to attend. Perhaps the most important board decision, conveyed by Macfarlane, was the transfer of the power to sign deeds. The board decided that it was in the company's best interest to transfer this power from Henry Sanford to E. R. Trafford and William Beardall. Trafford was the company's agent based in Sanford, Florida, while Beardall was sent to Sanford from London to serve as the Assistant Manager in the FLCC's Sanford office. The action, taken by the board, reflected the strained relations between Henry Sanford and his London-based partners. It represented an effort to limit the powers and influence of Henry Sanford in company decision-making and instead to reallocate these powers to two company-appointed agents. 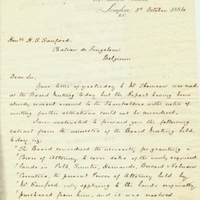 Original letter from A. W. Macfarlane to Henry Shelton Sanford, October 3, 1884: box 54, folder 1, subfolder 1.3, Henry Shelton Sanford Papers, General Henry S. Sanford Memorial Library, Sanford Museum, Sanford, Florida. Digital reproduction of original letter from A. W. Macfarlane to Henry Shelton Sanford, October 3, 1884. Box 54, folder 1, subfolder 1.3, Henry Shelton Sanford Papers, Henry Shelton Sanford Papers, General Henry S. Sanford Memorial Library, Sanford Museum, Sanford, Florida..
Macfarlane, A. W. . “Letter from A. W. Macfarlane to Henry Shelton Sanford (October 3, 1884).” RICHES of Central Florida accessed April 23, 2019, https://richesmi.cah.ucf.edu/omeka/items/show/3395.